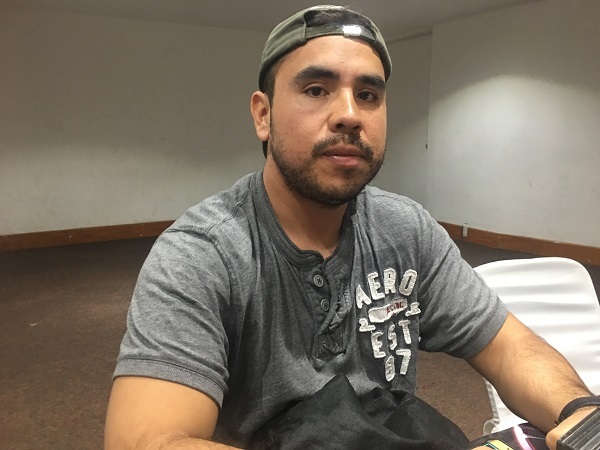 Christian Israel Marin Olivares was at Table 7 in our Round 9 Top Tables Update, and is using a DARK Virus Deck built around cards from Structure Deck: Lair of Darkness. Even though he lost in Round 9, he still has a 6-2-1 record, and a win will likely guarantee him a spot in the Top 64. He’s now Dueling against Jose Jesus Arroyo Sandoval and his Paleozoic Dinosaur Deck, which we covered in yesterday’s Round 7 Feature Match. Like Marin Olivares, Arroyo Sandoval also has a 6-2-1 record. Which one of these Duelist will prevail? It’s time to Duel! Arroyo activated Lost World and then ended his turn. Marin opened up with Artifact Sanctum, Monster Reborn, Lilith, Lady of Lament, 2 copies of Terraforming, and Ash Blossom & Joyous Spring. He activated Terraforming to add Lair of Darkness to his hand and then Arroyo discarded Droll & Lock Bird from his hand to prevent Marin from searching his Deck any more during the turn. He activated Lair of Darkness and then Normal Summoned Lilith. He attacked directly with Lilith to inflict 500 points of damage and then Set Artifact Sanctum before ending his turn. Arroyo Set a card to his back row and passed. Marin drew Dragon Shrine! He activated it to send Darkest Diabolos, Lord of the Lair from his Deck to his Graveyard and then attacked directly with Lilith. Arroyo activated Paleozoic Candina in his Main Phase, targeting Lilith, and Marin Chained Lilith’s effect to Tribute it and reveal 2 copies of Back to the Front and Full Force Virus from his Deck. He randomly Set Back to the Front to his field and then Special Summoned Diabolos from his Graveyard. Arroyo Summoned Babycerasaurus next, and Marin Special Summoned a Token to his field with Lost World. Babycerasaurus attacked the Token, and then Arroyo used Lost World’s effect to destroy Babycerasaurus from his Deck to Special Summon Souleating Oviraptor with the Babycerasaurus’s effect. He added Ultimate Conductor Tyranno from his Deck to his hand with the effect of the Oviraptor. He attacked the Token with his Oviraptor to destroy it, and in Main Phase 2, Marin flipped Artifact Sanctum to Special Summon Artifact Scythe from his Deck and activate its effect. Arroyo then used the effect of his Oviraptor to destroy the Babycerasaurus on his field and Special Summon one from the Graveyard, and Marin used Ash Blossom & Joyous Spring to negate the effect of the Babycerasaurus that was destroyed. Arroyo Set a card to his back row and passed. Marin drew a card and then Arroyo activated Paleozoic Dinomischus. He discarded Droll & Lock Bird to banish Lair of Darkness, and Arroyo Chained Back to the Front to Special Summon Lilith to his field. Arroyo Chained the effect of the Canadia in his Graveyard to Special Summon it, and then the Chain resolved. Marin activated Terraforming next, adding another Lair of Darkness to his hand. Arroyo sent another Droll & Lock Bird from his hand to his Graveyard to activate its effect, and then Marin activated Lair of Darkness. He used Diabolos’s effect to Tribute the Babycerasaurus on Arroyo’s field and force Arroyo to put the card in his hand on top of his Deck. He attacked Canadia with Scythe next, and Arroyo used Lost World to protect Canadia and destroy Babycerasaurus from his Deck. He Special Summoned Miscellaneousaurus from his Deck with the effect of Babycerasaurus. Diabolos attacked and destroyed Oviraptor. Marin used Lilith’s effect in Main Phase 2 to Tribute Scythe and reveal 2 copies of Full Force Virus and a Torrential Tribute from his Deck. He randomly Set Full Force Virus to his field. He Set Artifact Sanctum next and then ended his turn. Arroyo banished 2 Dinosaurs from his Graveyard to Special Summon Ultimate Conductor Tyranno and Marin Special Summoned a Token to his field. Arroyo switched all of his monsters into Attack Position and then attacked a Token with Canadia. He used Lost World to protect the Token and destroy Giant Rex from his Deck, and then attacked Lilith with Tyranno; but thanks to Lair of Darkness, Marin was able to use Lilith’s effect to Tribute Ultimate Conductor Tyranno and randomly Set Back to the Front from his Deck. Miscellaneousaurus attacked and destroyed Lilith next. Marin drew Artifact Scythe and then activated Monster Reborn to Special Summon Lilith back from his Graveyard. He used Lilith’s effect to Tribute Miscellaneousaurus and reveal Eradicator Epidemic Virus, Torrential Tribute, and Full Force Virus from his Deck. He randomly Set Eradicator Epidemic Virus to his field and then attacked Canadia with Lilith. Arroyo protected Canadia by destroying Jurrac Dino from his Deck. Diabolos attacked and destroyed Canadia next, banishing it from the Duel. Arroyo drew a card and then banished 4 Dinosaurs from his Graveyard, including Giant Rex, with Miscellaneousaurus’s effect to Special Summon Souleating Oviraptor from his Deck. He activated the effects of Lost World, Oviraptor, and Giant Rex in Chain, and then Marin flipped Eradicator Epidemic Virus declaring Spells, Tributing his Diabolos to destroy Lost World and force Marin to reveal the Survival’s End in his hand. Arroyo added Overtex Qoatlus to his hand with the effect of Ovirpator. He combined his Giant Rex with his Oviraptor to Xyz Summon Tornado Dragon and then used its effect to destroy Lair of Darkness. Marin Chained Lilith’s effect to Tribute Tornado Dragon and Set Evenly Matched from his Deck. Marin Special Summoned Qoatlus next by shuffling 5 of his banished Dinosaurs back into his Deck. He attacked Lilith with Qoatlus, destroying it in battle. Arroyo Set a card to his back row and then Marin flipped Artifact Sanctum in the End Phase. 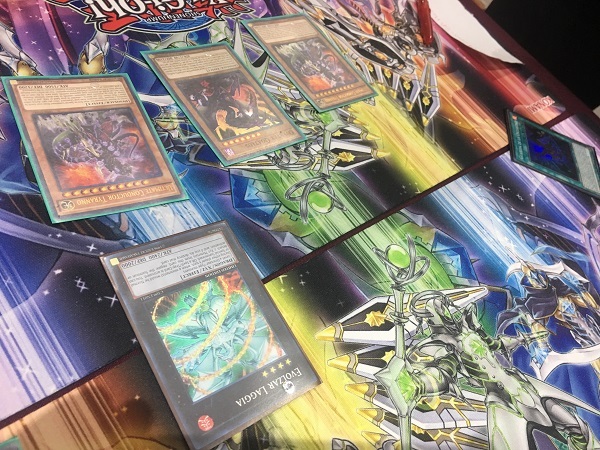 Marin Chained the Dinomischus in his Graveyard to Special Summon it and then Arroyo Special Summoned Artifact Scythe from his Deck. Marin drew Evenly Matched and the Arroyo flipped Survival’s End! He destroyed 2 Tokens on Marin’s field that he had been accumulating, and destroyed the Dinomischus on his own field, and Special Summoned Oviraptor, Babycerasaurus, and Miscellaneousaurus from his Deck! He activated Back to the Front to Special Summon Lilith from his Graveyard and then used Lilith’s effect to Tribute Lilith and reveal Torrential Tribute, Artifact Sanctum, and Full Force Virus from his Deck. He randomly Set the Torrential Tribute and shuffled the other 2 cards back into his Deck. He activated the effect of the Diabolos in his Graveyard next, Special Summoning it to the field. He attacked Oviraptor with Scythe to destroy it, and then attacked Babycerasaurus with Darkest Diabolos. Arroyo used the effect of the Survival’s End in the Graveyard to banish it from the Graveyard and destroy Babycerasaurus and Marin’s face-down Evenly Matched, and then Special Summoned Megalosmasher X from his Deck with the effect of Babycerasaurus. Marin attacked and destroyed it with Darkest Diabolos. Miscellaneousaurus was sent to the Graveyard in the End Phase due to the effect of Survival’s End. Arroyo drew Terraforming and sent it to the Graveyard due to the effect of the Eradicator Epidemic Virus. He banished Miscellaneousaurus and 3 other Dinosaurs from his Graveyard to Special Summon Oviraptor and used its effect to add Ultimate Conductor Tyranno from his Deck to his hand. Then, he combined 2 Dinosaurs to Xyz Summon Evolzar Laggia, and then banished 2 Dinosaurs from his Graveyard to Special Summon Ultimate Conductor Tyranno. Marin activated Full Force Virus, Tributing Diabolos, and then Chained Torrential Tribute; but the Torrential Tribute was negated by the effect of Laggia! The Duel was over moments later, when Arroyo Special Summoned another Ultimate Conductor Tyranno from his hand. 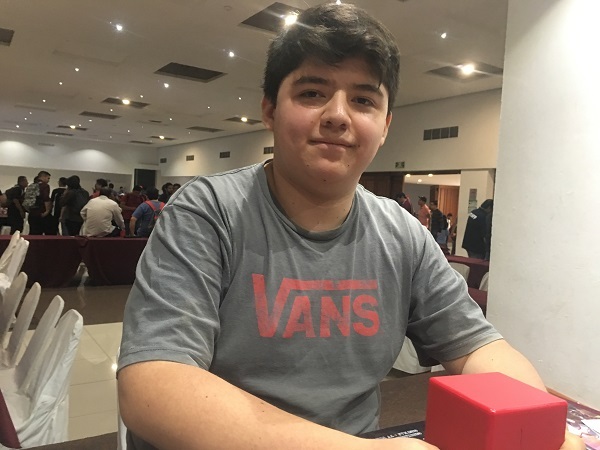 Time in the round was called before Duelists were able to enter the second Duel, and Jose Jesus Arroyo Sandoval was declared the winner of the Match, ending the Swiss Rounds with a 7-2-1 record and earning him a spot in the Top 64!